1997, 134 pages. Genre : (Semi) Non-Fiction, Humor. Overall Rating : C+. Six Christmas-themed stories (3 new, 3 previously-published) by David Sedaris. Among them : an over-the-top Christmas letter, a review of the neighborhood kiddie Christmas pageants, and a Christmas-is-Giving rivalry between two famiies that gets out of hand. Sedaris' wit is dry and hilarious. I kept laughing out loud, which isn't always desirable when one's spouse is trying to sleep. It's a quick, easy read. If, on December 30th, you realize you're still one book short of your reading goal (and a 5-squared review too! ), Holidays On Ice is your answer. The best of the six stories is Santaland Diaries, recounting Sedaris' job at 33 years old of being a seasonal "Santa's Elf" at Macy's. The Christmas Pageant Review story, and "Dinah, the Christmas Whore" are good as well. The Christmas Letter story is a bit too in-your-face, even for me. Somehow, a tale with a dead baby (Spoiler alert : "I said WATCH the baby, not WASH the baby!) in a Christmas book is just inappropriate. The "Christmas is Giving" story goes on way too long. Overall, this is an uneven set of stories, and not a good choice as your first Sedaris book. Finally, this book sold for $8.99 new?! For 134 pages?! What a rip. "Congratulations, Mr. Sedaris. You are an elf!" There apparently is some controvery about Sedaris' books. The NYT lists them in their Non-Fiction list, yet it is alleged that some of his essays are ...erm... hyperbolized. I've read three of his books so far, and all I can say is : I certainly hope Sedaris availed himself to hyperbole. If not, he was raised in the most dysfunctional family imaginable, and half the people he's met in life are shoe-ins (shoo-ins?) for the loony bin. In closing, here are two quick teasers from the Santaland Diaries. If you find them funny, you'll enjoy David Sedaris. If not, Art Linkletter books are still around. I like the way you write your reviews. I like it how you first present what was great about the book and then "What's not too like" later. I've never read Sedaris or Linkletter. Perhaps, I'll try Linkletter first. 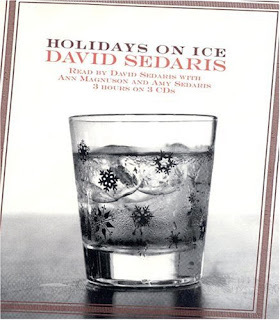 But I'll keep Sedaris in mind if I'm a bit short on Dec. 30th like you suggested. Yeah, no offense to David Sedaris, he's funny sometimes, but he has two problems in my mind - one is that he just seems like a big fat liar. No offense to the guy. No one of his stories I've heard or read is completely unbelievable (though some are close), but in combination? Come on, buddy, if you want to make these stories up, just don't call it a memoir. I guess I don't KNOW he's a liar, but... I dunno, it just bugs me. Two, is that when you're done hearing a story you're left feeling like Sedaris sounds - utterly joyless, able to feel any pleasant emotion only by sniggering at the failings of every human being you meet. Okay, I have two comments. The first is that I've only ever heard of David Sedaris recently and have never been interested in his stuff - from the reviews I've read on the fifty books project website, he doesn't sound like my style. The second comment is that I recently started a short story that involves a character who claims he made his fortune by writing two books, both of which were touted as memoirs and were discovered to be fictional, and he avoided lawsuits by protesting adamantly that he never said they were fact, which was true. Of course, it's debateable that this little story he tells is even true... :) That's what your comment reminded me of, Jason. Julie - Art "Kids Say The Darnedest Things" Linkletter is the polar opposite of Sedaris. All his humor is clean, cute, without a even a hint of a putdown. if there was a cleaner rating than "G", hed' get it. whether or not he's therefore funnier than Sedaris is a matter of taste. Jason - i agree with your assessment of Sedaris. i'd only add that his remarks about himself are no less caustic and sniggering than his remarks about others. whether that's noble or sad is a good question. Amanda & Jason - here's a true anecdote about a "memoir". my son (who's also named Jason, so this'll get confusing) was a talented writer, even back in high school. he had a creative writing class and excelled at it. most of his stuff we've never seen, but Liz did once come across one of his ...um... essays while cleaning his room. "I hate it when my Dad drinks. He hits my Mom and makes her cry, and that makes me cry too. Someday, I'll move away from this hell, and learn to smile again." it was well-done, and at the top, the teacher had written "Oh Jason. If this is a true account, I'm so so sorry for you. It's so sad." okay, it isn't true. but it certainly sounded true when penned by Jason. and i'm thinking - at the next parent-teacher conference, that teacher is sure gonna be looking at me strangely. when i asked Jason later about the "memoir", he laughed and said he was amused that the teacher bought into the story. i regard the teacher as a bit gullible; i'm in awe of Jason's ability to pen a believable piece of fiction; and i hope he'll never incorporate a fictional/believable "me" into his stories again. i'm guessing Sedaris' parents and siblings feel the same way. In a similar vein, in kindergarten, our son Morrigan had to write a bunch of sentences of -ill words. He chose "pill" for one of those words, and wrote "My mom takes pills." This was following a week of -ack rhyme words, where he drew a picture of a big kettle with what looked like boiling water in it, and labeled it "crack." yeah. just remember Morrigan's literary talents the next time you're trying to get the very last bit of ketchup out of the bottle by holding it upside-down and pounding the bottom. Hey, when I was in elementary school, my mom was saving up for a new set of pots and pans. This little nest egg became known between my brother and I as mom's 'pot money'. She never thought it was that funny.